Jinjiang Inn Hefei Lujiang Road is located in the downtown area of Hefei, capital city of Anhui Province, which witnesses the historical changes of Hefei through the more than half a century. Adjoining the prosperous Sipailou Business District and extremely boisterous Huaihe Road Pedestrian Street in the east, next to Baohe Park and Yinhe Park of beautiful scenery in the south; close to the Ladies Street that is favorite of petty bourgeoisie and Chenghuang Temple Business District in the north; neighboring Baida CBD Shopping Business District in the west, the Hotel surrounding area is featured by prosperous business, numerous wine shops and convenient transportation. As a rare place in the noisy urban area, the Hotel is of great value in particular! The profound history cannot stop the step of this old street move forward. Now, Jinjiang Inn Hefei Lujiang Road will add thick and heavy radiance to the street, creating a burst of more dazzling light! The sky is growing bright in the east, and the thread-like sunlight in the morning passes through the gaps of southern magnolias, creating many abstract paintings. In the beautiful science and technology city lying by Yangze River and Huaihe River, there is the historical charm of hometown of Three Kingdoms and native place of Baozheng, which brings out the best in each other with the development of modern science & education and culture as well as the new construction of city, showing the ancient and modern glamour. If being hometown of Three Kingdoms and native place of Baozheng is a historical name card of Hefei, then the city of science and education and the new city by lake are her current reputation. By staying here for a little while, recalling the Three Kingdoms, one can remember the age of war of this fortress in Kingdom of Wu, the nickering horses and sounding drums, and the valiant charm of Zhang Liao who inspired awe throughout Xiaoyao Ferry; in the history of a thousand years, the city of strategic importance when fighting with the Jin State in the Southern Song Dynasty witnessed a lot of scenes with shining spears and armored horses and honors winning in war; Bao Zheng, who was praised as the symbol of brightness and justice, still has the solemn manner! Wandering in Baohe Park and taking a boat on the lake, one can enjoy the cool breeze and the copper bells hung in Qingfeng Pavilion jumping in the breeze, and his heart seems to be melt into the green trees, clean water and white bridge. The feeling is so soft that the heart can be touched. By reading a book of history, tasting a bottle of fragrant tea, slowing down your pace and relaxing your mood, your soul will be integrated into the city... After all prosperity and noise, only the tranquility is left. With lights waning, the city is quiet in the curtain of night. The red spirits sparkling behind the rows of matchboxes on the road become fewer and fewer. With the warm orange light, you can appreciate the red wall and green tiles of Mingjiao Temple, which used to be the point set of Cao Cao, but now the elegance has gown and only the historical mottled shade is left. If you are tired and weary and want to find a harbor to get physically and mentally rested, Jinjiang Inn Hefei Lujiang Road has prepared everything for you! You can organize your thoughts and fly your heart here... There is unique decoration style, environmental-friendly and healthy decoration concept, and all details of the room manifest the human inherent and true qualities. The Hotel has created a free and fresh space for you so that your tired body and mind can be completely relaxed. The strong infrared ray anti-theft system and the comfortable and sleeping-helpful Somerelle bedding articles make you feel more assured during the stay. The featured Xinglianxin Cafe has elaborately created healthy and nutritious breakfast for you, adding guarantee for your health. With good mood, you are invited to start here happily. 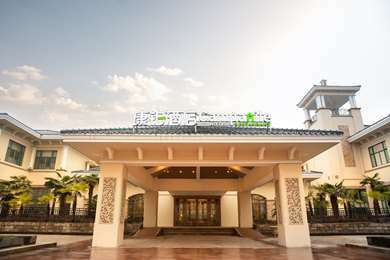 Welcome to Jinjiang Inn Hefei Lujiang Road!